THE LIGHT #2. Graphite pencil, prisma color pencil, ink, acrylic. 30 x 40 inches. THE LIGHT #3. Graphite pencil, prisma color pencil, ink, acrylic, 25 x 25 inches. THE LIGHT #4. Graphite pencil, prisma color pencil, ink, acrylic, 25 x 25 inches. THE LIGHT #5, Graphite pencil, prisma color pencil, ink, acrylic, 25 x 25 inches. THE LIGHT #7. Graphite pencil, prisma color pencil, ink, acrylic, 40 x 30 inches. THE LIGHT #8. Graphite pencil, prisma color pencil, ink, acrylic. 25 x 25 inches framed. THE LIGHT drawing series explores notions of light in a variety of form, context, symbol, signification, and association. Sources, data and references – often presented and composed simultaneously – encompass the colliding worlds of science, religion, and art. From light as an elemental particle/photon, a measurable wave set in motion or shaped by forces of gravity, to spectral and spiritual phenomena, visual experience and component of color and color perception, or subjective/objective experience, each piece in the series evolves in complexity, juxtaposition, scale, optical play, and manipulation of data and medium. Botticelli’s spectral spirits (from his Dante’s Inferno drawings) share a multilayered compositional space with data on optics and quantum physics. Light (Yellow) is placed in stark contrast with dark (Black). Theories of Josef Albers collide with the theories of Albert Einstein, properties of crystals, alchemy and mysticism. Representations of light and shape contrast spatially and in mass with gestural marks both real (actual paint/brush strokes) and simulated (drawn and replicated echoes). Like previous drawing series (CODEX, SYNCHRONICITY, ACCOUNTING FOR, ORDER, and RELATIVITY) strategies of semiotics and language are at play, filtering and arranging the selection and composition of thematic material, while orchestrated through the interaction of surface, media, and the imagination of the artist. Paul Glabicki is re-known for his experimental film animations that have appeared at major film festivals, as well as national and international museum exhibitions. His animation work in film has been carefully crafted by means of thousands of hand-drawn images on paper – each drawing representing both a frame of film and a unique complete work on paper. His film works have been widely screened at such prestigious sites as the National Gallery of Art, New York Film Festival at Lincoln Center, the Cannes Film Festival, the Museum of Modern Art, Whitney Museum of Art in New York (Whitney Biennial), and the Venice Biennale. He has received numerous awards, grants, and fellowships, including a Guggenheim Fellowship, grants from the National Endowment for the Arts, the American Film Institute, and several grants from the Pennsylvania Council on the Arts. 1977: ANTHONY G. TRISOLINI FELLOWSHIP. Award for Advanced Graduate Research in Interdisciplinary Arts; $5,000; Ohio University. 1977: FILM PRODUCTION GRANT. Awarded for production of the film: DIAGRAM FILM; Sinking Creek Film Festival; $2,000; Nashville, Tennessee. 1981: ARTIST FELLOWSHIP IN MEDIA ARTS. Awarded for support of the film: FILM- WIPE-FILM; $1,900; The Pennsylvania Council on the Arts. 1982: CENTRAL RESEARCH DEVELOPMENT FUND GRANT. Awarded for support of research in language, visual analogy, drawing, and animated film; $2,510; University of Pittsburgh. 1983: MID-ATLANTIC REGION MEDIA ARTS FELLOWSHIP. Awarded for support of the film: OBJECT CONVERSATION; $3,000; National Endowment for the Arts, and American Film Institute. 1983: ARTIST FELLOWSHIP IN MEDIA ARTS. Awarded for continued work in Drawing and Animated Film; $4,000; The Pennsylvania Council on the Arts. 1985: INDIVIDUAL ARTIST GRANT IN MEDIA ARTS: Awarded for work in Film Animation; $18,000; The National Endowment for the Arts. 1986: MID-ATLANTIC REGION MEDIA ARTS FELLOWSHIP. Awarded for support of work in progress: UNDER THE SEA; $7,000; Pennsylvania Council on the Arts, National Endowment for the Arts and The American Film Institute. 1986: GUGGENHEIM FELLOWSHIP. Awarded for work in Film Animation, travel and research in Japan; $21,000; the John Simon Guggenheim Memorial Foundation. 1988: AMERICAN FILM INSTITUTE INDEPENDENT FILMMAKER GRANT. Awarded for support of the film: UNDER THE SEA; $17,250; The American Film Institute. 1990: CENTRAL RESEARCH DEVELOPMENT FUND GRANT. Awarded in support of work in Computer Composition and Animation; $12,450; Office of Research, University of Pittsburgh. 1991: MID-ATLANTIC REGION MEDIA ARTS FELLOWSHIP. Awarded for continued experimentation in Computer Art and Animation; $7,000; Pennsylvania Council on the Arts. 1995: ARTIST FELLOWSHIP IN INTERDISCIPLINARY ART. Awarded for work in Drawing, Painting, Video, and Computer Art; $5,000; Pennsylvania Council on the Arts. 1997-99: CENTRAL RESEARCH DEVELOPMENT FUND GRANT. Awarded for work in Computer Art and Animation; $14,000; Office of Research, University of Pittsburgh. 1970: MARTIN B. LEISSER AWARD. Carnegie-Mellon University. 1971: NATIONAL COLLEGIATE DRAWING COMPETITION AWARD. University of Tennessee. 1971: EMILY PHYLLIS HOWARD ANNUAL PAINTING AND SCULPTURE AWARD. Carnegie Mellon University. 1972: EMILY PHYLLIS HOWARD ANNUAL PAINTING AND SCULPTURE AWARD. Carnegie Mellon University. 1972: GRADUATE TEACHING ASSISTANTSHIPS. School of Art, Ohio University. 1977: PURCHASE AWARD. Associated Artists of Pittsburgh Annual Exhibition; Carnegie Museum of Art. 1977: JURY AWARD. Ann Arbor Film Festival; Award to film: DREAM 733. 1977: JURY AWARD. Georgia Museum of Art; Award to film: DREAM 733. 1977: JURY AWARD. Northern Illinois University; Award to film: DREAM 733. 1978: JURY AWARD. Ann Arbor Film Festival; Award to film: SCANNING. 1978: JURY AWARD. Ann Arbor Film Festival; Award to film: SEVENTY-SIX AT HOME. 1978: FIRST PRIZE IN ANIMATION. Marin County National Film Competition; San Rafael, California; Award to film: DIAGRAM FILM. 1978: SPECIAL JUROR’S AWARD. Marin County National Film Competition; awarded by Juror Gunvor Nelson to DIAGRAM FILM. 1979: JURY AWARD. ASIFA-EAST Animation Awards; New York, New York; Merit Award for Sound Direction of the film: DIAGRAM FILM. 1979: JURY AWARD. Ann Arbor Film Festival; Award to film: DIAGRAM FILM. 1979: FIRST PRIZE. Big Muddy Film Festival; Southern Illinois University, Carbondale, Illinois; Award to film: DIAGRAM FILM. 1979: JURY AWARD. Kent Film Festival; Kent State University; Award to film: DIAGRAM FILM. 1979: JURY AWARD. Virginia Commonwealth University, Richmond, Virginia; Award to film: DIAGRAM FILM. 1979: FIRST PRIZE. Athens International Film Festival; Animation Category; Athens, Ohio; Award to film: DIAGRAM FILM. 1979: FIRST PRIZE. Baltimore International Film Festival; Experimental Film Category; Award to film: DIAGRAM FILM. 1979: JURY AWARD. Bellevue International Film Festival; Bellevue, Washington; Award to Film: DIAGRAM FILM. 1979: JURY AWARD. New York Filmmakers Exposition; Award to film: DIAGRAM FILM. 1979: JURY AWARD. The Cinematheque; San Francisco Art Institute; Award to film: DIAGRAM FILM. 1980: JURY AWARD. Sinking Creek Film Festival; Nashville, Tennessee; Award to film: FIVE IMPROVISATIONS. 1980: JURY AWARD. Purdue University; Award to film: FIVE IMPROVISATIONS. 1980: JURY AWARD. Kent Film Festival, Kent State University; Award to film: FIVE IMPROVISATIONS. 1980: JURY AWARD. Ann Arbor Film Festival; Award to film: FIVE IMPROVISATIONS. 1980: JURY AWARD. Terminal Cinema Film Festival; Northern Illinois University; Award to film: FIVE IMPROVISATIONS. 1981: JURY AWARD. New York Filmmakers Exposition; Award to film: FIVE IMPROVISATIONS. 1983: JUROR’S AWARD. “Art as the Image of America,” Invitational Painting and Drawing Exhibition; Indiana University of Pennsylvania; Juror: Patterson Sims. 1983: GRAND PRIZE. Thomas Edison Black Maria Film and Video Competition; West Orange , New Jersey; Award to film: FILM-WIPE-FILM. 1983: SILVER HUGO AWARD. Chicago International Film Festival; Animation Category; Award to film: FILM-WIPE-FILM. 1983: JUROR’S AWARD. 1983 Small Works National, Zaner Gallery, Rochester, New York; Juror: Patterson Sims. 1984: JURY AWARD. New York Filmmakers Exposition; Award to film: FILM-WIPE-FILM. 1984: JURY AWARD. Baltimore International Film Festival; Award to Film: FILM-WIPE-FILM. 1984: JURY AWARD. Ann Arbor Film Festival; Award to film: FILM-WIPE-FILM. 1984: JURY AWARD. Sinking Creek Film Festival; Nashville, Tennessee; Award to film: FILM-WIPE-FILM. 1984: JURY AWARD. The Festival of Experimental Film, Experimental Film Coalition & Art Institute Chicago; Award to film: FILM-WIPE-FILM. 1985: JURY AWARD. The Festival of Experimental Film, Experimental Film Coalition & Art Institute of Chicago; Award to film OBJECT CONVERSATION. 1985: JURY AWARD. Sinking Creek Film Celebration; Nashville, Tennessee; Award to film: OBJECT CONVERSATION. 1985: FIRST PRIZE. Best Film of the Festival and Best Art/Experimental Film; Bucks County Film Festival; Doylestown, PA Award to film: OBJECT CONVERSATION. 1985: GRAND PRIZE. Thomas Edison Black Maria Film and Video Festival; West Orange, New Jersey; Award to film: OBJECT CONVERSATION. 1986: JURY AWARD. San Francisco Art Institute Film Festival; Award to film: FILM-WIPE-FILM. 1986: FIRST PRIZE. Best Experimental Film; The 10th Atlanta Film and Video Festival; Atlanta, Georgia; Award film: OBJECT CONVERSATION. 1986: FIRST PRIZE. Athens International Film Festival; Animation Category; Athens, Ohio; Award to film: OBJECT CONVERSATION. 1986: JURY AWARD. 19th Annual Humboldt Film Festival; Humboldt State Univ, Arcata, California; Award film: OBJECT CONVERSATION. 1987: JURY AWARD. 1987 Cinamina International Film Festival; Portugal; Award collaborative film: ACADEMY LEADER VARIATIONS. 1988: JURY AWARD. ASIFA-East Animation Awards, New York; Award shared with 19 others for the film: ACADEMY LEADER VARIATIONS. 1988: FIRST PRIZE. Blue Ribbon, the 1988 American Film and Video Festival; New York; Award shared: ACADEMY LEADER VARIATIONS. 1989: OHIO UNIVERSITY ALUMNI MEDAL OF MERIT. Presented by the National Alumni Board of Directors of the Ohio University Alumni Association; Award for Outstanding Achievement in Art, Filmmaking, and Education. 1989: GRAND PRIZE. Thomas Edison Black Maria Film Festival; West Orange, New Jersey; Award to film: UNDER THE SEA. 1990: SPECIAL JURORS’ AWARD. For Technical Excellence in Animation; the 14th Annual Atlanta Film and Video Festival; Atlanta, Georgia; Award to film: UNDER THE SEA. 1990: BEST OF ANIMATION AWARD. 28th Ann Arbor Film Festival; Award to the film: UNDER THE SEA. 1990: JURY AWARD. Sinking Creek Film Festival; Nashville, Tennessee; Award to film: UNDER THE SEA. 1991: JURY AWARD. New York Filmmakers Exposition; Award to film: UNDER THE SEA. 1993- RESEARCH FELLOW APPOINTMENT. The Studio for Creative Inquiry; Carnegie Mellon University; Pittsburgh, Pennsylvania. 2001: ARTIST OF THE YEAR. Pittsburgh Center for the Arts; Awarded by a panel of regional art leaders and artists; Pittsburgh, Pennsylvania. 1974: Ohio University. Seigfred Gallery; Paintings, Drawings, and Film; Athens, Ohio. 1977: Vanderbilt University. Sinking Creek Film Festival; Recent Films and Drawing Studies; Nashville, Tennessee. 1977: Pittsburgh Filmmakers Media Arts Center. Recent Films; Pittsburgh, Pennsylvania. 1977: Pittsburgh Filmmakers Gallery. Photographs, and Drawings for Animated Film; Pittsburgh, Pennsylvania. 1978: Vanderbilt University. Sinking Creek Film Festival; Recent Films, Photographs, and Drawing Studies; Nashville, Tennessee. 1980: Ohio University. Athens International Film Festival; Recent Films; Athens, Ohio. 1981: University of Pittsburgh. UP Gallery; Drawings and Studies for Animated Film; Pittsburgh, Pennsylvania. 1981: Carnegie Museum of Art. Section of Film and Video; Films and Process; Pittsburgh, Pennsylvania. 1982: Philadelphia College of Art. Films and Drawings. Philadelphia, Pennsylvania. 1982: Albright College. Berk’s Filmmakers; Films and Drawings; Reading, Pennsylvania. 1982: Ann Arbor Film Festival. Juror’s Retrospective; Ann Arbor, Michigan. 1983: Kent State University. Films and Drawings; Kent, Ohio. 1984: State University of New York at Fredonia. Films and Drawings; Fredonia, New York. 1984: The Mattress Factory. Films and Drawings; Pittsburgh, Pennsylvania. 1984: New Laboratory Theater. Recent Films; Pittsburgh, Pennsylvania. 1984: School of the Art Institute of Chicago. Films and Drawings; Chicago, Illinois. 1985: The Museum of Modern Art. Cineprobe Program of Films and Drawings; New York, New York. 1986: Virginia Museum of Fine Arts. Films and Drawings; Richmond, Virginia. 1986: West Virginia State College. Films and Drawings; Institute, West Virginia. 1986: University of Arizona. Department of Drama; Films and Drawings; Tucson, Arizona. 1986: Ohio University. Athens International Film Festival; Films and Drawings; Athens, Ohio. 1986: Donnell Library Center. New York Public Library; Recent Films and Film Studies, New York, New York. 1987: Los Angeles Film Forum. Films and Drawings; Los Angeles, California. 1987: California Institute of the Arts. Films and Drawings; Valencia, California. 1987: Osaka Designer’s College. Films and Drawings; Osaka, Japan. 1987: Image Forum, Tokyo. Films and Drawings; Tokyo, Japan. 1987: Edinboro University. Films and Drawings; Edinboro, Pennsylvania. 1988: Currier Gallery of Art. Films, Drawings, Works-in-Progress; Manchester, New Hampshire. 1989: Tokyo Designer’s College. Films and Drawings; Tokyo, Japan. 1989: Image Forum, Tokyo. New Works in Film and Drawing; Tokyo, Japan. 1989: Osaka Designer’s College. New Works in Film and Drawing; Osaka, Japan. 1989: International House of Japan. Films and Drawings; Tokyo, Japan. 1989: Carnegie Museum of Art. Section of Film and Video; New Work in Film; Pittsburgh, Pennsylvania. 1990: Carnegie Mellon Art Gallery. Films, Paintings, and Drawings; Pittsburgh, Pennsylvania. 1990: 1414 Monterey Gallery/The Mattress Factory. “This is Just That,” an Installation Piece; Pittsburgh, Pennsylvania. 1991: Carnegie Museum of Art. Section of Film and Video; FilmFront Series: Film Retrospective; Pittsburgh, Pennsylvania. 1991: Forum Gallery/Carnegie Museum of Art. Work in Computer Animation, Drawing, and Installation; Pittsburgh, Pennsylvania. 1991: Arizona Center for Media Arts. The Screening Room; New Films; Tucson, Arizona. 1992: Itoki Gallery. Visible Art Today series: Glabicki: Works in Video and Art; Hiroshima, Japan. 1993: Cinematograph-Filmverleih. Films and Computer Animation; Innsbruck, Austria. 1993: Moviemento. Films and Computer Animation; Linz, Austria. 1993: Kino im Augarten. Films and Computer Animation; Graz, Austria. 1993: Academy of Applied Arts of Vienna. Films and Computer Animation, Video Installation; Vienna , Austria. 1993: Filmcasino Theater. Film Retrospective; Vienna, Austria. 1993: Rochester Institute of Technology. Films, Drawings, Computer Animation; Rochester, New York. 1995: Center For Contemporary Arts. Installation of Computer Animation, 3-D Projection of Computer-Generated Memory Spaces; Cincinnati. 1997: Film Gallery: Carnegie Museum of Art. “Artist’s Films from the 1960s and 1970s: Films of Paul Glabicki;” Carnegie Museum of Art, PA.
2001: Pittsburgh Center for the Arts. “Artist of the Year – 2001,” installation and premiere of computer animation video piece FULL MOON, with a second collaborative sound piece “Optical Poem: Sequentia Absentia,” with sound artist Paul Miller (aka DJ SPOOKY). 1972,’75 Associated Artists Annual Juried Exhibitions. Carnegie Museum of Art, Pittsburgh, ‘76,’77: Pennsylvania. 1974: Paperworks; Drawing Exhibition; Pittsburgh Center for the Arts. 1977: Underground Cinema-12 Series; Touring Program of Independent Film. 1977: Contemporary Media Arts Center. Dayton, Ohio. 1977: Theater Vanguard. Los Angeles, California. 1977: Best of the Ann Arbor Film Festival National Touring Program. 1977: Georgia Museum of Art. University of Georgia. 1977: The Cinematheque. San Francisco Art Institute. 1977: Walker Art Center. Minneapolis, Minnesota. 1977: Athens International Film Festival National Touring Program. 1977: Film Forum. Rapid Eye Movements Program; New York, New York. 1977: Antioch College. Yellow Springs, Ohio. 1977: Kent State University. Kent, Ohio. 1977: Fantamation. Award-wining Animation; Expanded Cinema Group, Univ. of Illinois. 1978: Contemporary Media Arts Center. Dayton, Ohio. 1978: The Film Center. School of the Art Institute of Chicago. 1978: Best of the Ann Arbor Film Festival National Touring Program. 1978: Washington Film Festival. Kennedy Center for the Performing Arts Washington, D.C.
1978: Independent Filmmakers Exposition. Metropolitan Museum of Art, New York. 1978: Independent Animators and Animation. The Drawing Center; New York, New York. 1979: New Independent Cinema. Hirshorn Museum; Washington D.C.
1979: Suspended Animation Exhibition. Exhibition of Drawings for Film; And/Or Gallery, Seattle, Washington. 1979: Best of the Ann Arbor Film Festival National Touring Program. 1979: Pittsburgh Filmmakers: European Touring Program. 1979: Pennsylvania Film Exhibition. William Penn Museum; Harrisburg, Pennsylvania. 1979: Center Screen Animation Series. Carpenter Center for the Arts; Harvard University. 1979: The Cinematheque. San Francisco Art Institute. 1979: New York Independent Filmmakers Exposition National Tour. 1979: The Expanded Cinema Group. Champaign, Illinois. 1979: Great Lakes Invitational Film Festival. Milwaukee, Wisconsin. 1979: Venice Biennale. New American Cinema; Serious Business Company, Curator: Freude Bartlett; Venice, Italy. 1979: Rialto Theater. Berkley, California. 1979: Oakland Museum. Oakland, California. 1979: Smithsonian Institute. New American Cinema; Washington D.C.
1979: Chicago Filmmakers. Chicago, Illinois. 1979: Portland Art Museum. Portland, Oregon. 1980: Film Forum. New American Animation; New York, New York. 1980: Synthetic Movements: New Directions in American Animation. Touring Program; American Federation of the Arts. 1980: Lightning Ridge Film Society. Adamant, Vermont. 1980: L.A. Film Oasis. Los Angeles, California. 1980: Madison Art Center. Madison, Wisconsin. 1981: Absolute Film. Exhibition on Visual Music and Abstract Film. University of California at Santa Cruz. 1981: Mo-Ming Gallery. So-Take-It-To-The-Presses Exhibition; Chicago, Illinois. 1982: Carpenter Center For the Arts: New Animation. Harvard University. 1982: Nickelodeon Theater. Lost Art Cinema Group; Columbia, South Carolina\. 1982: Pittsburgh Filmmakers National Touring Program. Pittsburgh Filmmakers Media Arts Center. 1982: New American Animation: Movie Club. International Film Programs; Lucca, Italy. 1983: Hirshorn Museum. New American Independent Cinema; Washington D.C.
1983: University Museum. Art As the Image of America exhibition, Drawing and Painting Exhibition; Indiana University of Pennsylvania. 1983: Small Works National. Zaner Gallery; Rochester, New York. 1983: Northwest Film Study Center. Portland, Oregon. 1983: Cambridge Invitational Animation Festival. American Animation Program; Cambridge, England. 1984: Best of the Ann Arbor Film Festival National Touring Program. 1984: New York Independent Filmmakers Exposition National Touring Program. 1984: The San Francisco Cinematheque. San Francisco Art Institute. 1984: Image Forum. Tokyo, Japan. 1985: Santa Fe Film Exposition Invitational. Center for Contemporary Arts; Santa Fe, New Mexico. 1985: Neighborhood Film Project. International House; Philadelphia, Pennsylvania. 1985: Hirshorn Museum. New American Independent Cinema; Washington D.C.
1985: Masterpiece Film Series. MetroArts Program at the William Penn Museum; Harrisburg, Pennsylvania. 1985: Hiroshima ‘85: The International Animation Festival of Japan; Hiroshima, Japan. 1985: Thomas Edison Black Maria Film and Video Festival National Touring Program. 1986: The Stuttgart Animation Festival. New American Animation; Stuttgart, Germany. 1986: Thomas Edison Black Maria Film and Video Festival National Touring Program. 1986: Stanford University. “Pixels and Predicates” curated and presented by Larry Cuba, Ventura Hall, Sandford, California. 1987: Whitney Biennial. The Whitney Museum of American Art; New York, New York. 1987: Santa Fe Film Exposition. Center for Contemporary Arts; Santa Fe, New Mexico. 1987: Whitney Biennial Film and Video National Touring Program. 1987: Hirshorn Museum. New American Cinema; Washington D.C.
1987: The American Film Institute. Los Angeles, California. 1987: The Seattle International Film Festival. Seattle, Washington. 1987: Pacific Film Archive. Recent American Animation; University Art Museum, Berkeley, California. 1988: The American Museum of the Moving Image. American Independent Animated Film: A Retrospective; Astoria, New York. 1988-89: Dartmouth College. Programs: Hans Richter and Beyond, and American Independents: A Change of Perception; Hanover, New Hampshire. 1989: Kansas City Contemporary Arts Center. New American Cinema; Kansas City, Missouri. 1989: Museum of Art: Oviedo. New Animation; Oviedo, Spain. 1989: World Animation Festival in Jean Jean. Naha City, Okinawa, Japan. 1989: Studio 200. Film Retrospective; Tokyo, Japan. 1989: The 3rd Itabashi International Animation Festival. Itabashi, Japan. 1989: 27th New York Film Festival. Premiere of the film UNDER THE SEA ; Lincoln Center, New York. 1990: Bombay International Film Festival. Bombay, India. 1990: International Animated Film Festival of Stuttgart. Stuttgart, Germany. 1990: Thomas Edison Black Maria Film and Video Festival National Touring Program. 1990: Deson/Saunders Gallery. Pittsburgh Today: Painting and Drawing; Curated by Elaine King; Chicago, Illinois. 1990: Santa Fe Film Exposition. Contemporary Arts Center; Santa Fe, New Mexico. 1990: New York University. Classics of American Film Program; ASIFA-East and the Tisch School of the Arts. 1990: Hiroshima ‘90: The International Animation Festival of Japan. Hiroshima, Japan. 1990: Deson/Saunders Gallery. Eclipse of Meaning: Paintings and Drawings by Paul Glabicki, Charles B. Luce, and David Russick; Chicago Illinois. 1990: San Francisco Cinematheque. Ink, Pixel, Xerox, and Clay: New Animated Films; San Francisco, California. 1990: 24th Annual New York Film Exposition of Short Film and Video. 1991: Society of Animation Studies. American Animated Films; George Eastman House, and the Rochester Institute of Technology. 1992: Penelic-Bowman-Megan Art Gallery. Electronic Expressions, Invitational Exhibition of Computer Art; Allegheny College, Meadville, PA.
1993: Austria Filmmakers Cooperative. Abstract +/- Figurative Films; Austria Filmmakers Cooperative and ASIFA Austria; Vienna, Austria. 1993: Brooklyn College. New Computer Art; Curated by Rene LeWinter; Brooklyn, New York. 1994: Zagreb ‘94:11th World Festival of Animated Films. Festival Anniversary Invitational Program; Zagreb, Croatia. 1994: Japan Industrial College. Group Animation Show ; curated by Sayoko Kinoshita; Tokyo, Japan. 1995: Susquehanna Art Museum. Emerging Images: Art by Computer; Harrisburg, Pennsylvania. 1996: Hiroshima ‘96: The International Festival of Animated Film of Japan. Fine Art Animation Program; Hiroshima, Japan. 1996: Pittsburgh Biennial. Pittsburgh Center for the Arts; Pittsburgh, Pennsylvania. 1997: Mattress Factory. “Process: Documentation and Fragments from the Mattress Factory Archives,” 1414 Monteray Galleries; Pittsburgh, PA.
1997: Mattress Factory. 20th Anniversary Art Exhibition and Auction. Mattress Factory, Pittsburgh, Pennsylvania, and Sotheby’s, New York. 1997: Musashino University of Art. Tokyo, Japan. 1998: University of Rome. “Metamorfosi: The Films of Paul Glabicki, Pat O’neill, and Jordan Belson;” Rome, Italy. 1998: Mostra Internazionale del Nuovo Cinema. “Animania: A Retrospective of American Experimental Cinema;” Pesaro, Italy. 1998: Holland Animation Film Festival. “Animation Survey: USA;” curated by George Griffin; Utrecht, Holland. 1998: Kyoto College of Art. “Experimental Animation;” curated by Sayoko Kinoshita; Kyoto, Japan. 1999: Fundacio Antoni Tapies. “Cine Calculado: Revision de Los Origenes y Pioneros de La Animacion por Ordenador;” curated by Eugeni Bonet; Barcelona, Spain; also traveled to Filmoteca de Zaragoza, Diputacion Provincial de Granada, and Museo Nacional Centro de Arte Renia Sofia, Madrid. 1999: Central Arts. “MA(R)KING;” a survey of artist mark making in 1999; curated by Elaine A. King; Tucson, Arizona. 2000: public LED display of computer animation works RED FENCE (1999) , and DARK ROOM/SIMPLE ROOF (1998); a project of FACT: the Foundation for Art and Creative Technology, Liverpool, United Kingdom. 2000: Art in Motion; The International Festival of Time-Based Media; The USC School of Fine Arts; University of Southern California. 2000: Black Maria Film and Video Festival 2000. National Touring Program. 2000: KINETICA 2: The Oskar Fischinger Centennial Celebration. Presented by the Iota Center, and the Motion Picture Academy of Arts and Sciences: the Museum of Modern Art, New York; Los Angeles County Museum of Art, Los Angeles: National Gallery of Art, Washington, DC; Pacific Film Archive, Berkekey, California. 2000: Pittsburgh Biennial; Pittsburgh Center for the Arts, Pittsburgh, Pennsylvania. 2000: Regina Gouger Miller Gallery. “Fusion: Artists in a Research Setting,” Carnegie Mellon University, Pittsburgh, Pennsylvania. 2001: Pittsburgh Filmmakers Traveling Show. Revival screening of the1982 program curated by Bruce Posner; Film Kitchen, Melwood Screening Room, Pittsburgh, Pa.
2001: Experience Music Project. “The Iota Collection: Experimental Animation 1970-1989;” curator: Larry Cuba, Iota Center, Los Angeles; Seattle. 2001: Oberhausen International Film Festival. Performance of “The Prolonged Present,” by sound artist Paul Miller, featuring his sound remixes, and animation sequences by Paul Glabicki; Oberhausen, May 7, 2001, Germany. 2001: Northwestern University. “Stereo Images,” and screening/installation of RED FENCE; in conjunction with the symposium “Immersive Environments,” curator: Annette Barbier; Chicago, Illinois. 2004: Los Angeles; International Tour: University of Southern California; Pacific Film Archive, Berkeley; Museum of Modern Art, New York; Cinematheque Ontario, Toronto; Harvard Film Archive, Cambridge; High Museum of Art, Atlanta; Anthology Film Archives, New York; Northwest Film Forum, Seattle; Centre Pompidou, Paris; and the National Gallery of Art, Washington, D.C.; Norwegian Film Festival, Grimstad Kulturhus; Paradiso, Amsterdam; Lux/The Other Cinema, London; Cambridge Film Festival, Cambridge, UK; Duke of York Picturehouse, Brighton, UK. 2001: Artists Image Resource, Inc., Foreland Street Gallery. “Photographs by Artists,” an invitational exhibition curated by Robert Raczka; Pittsburgh, Pennsylvania. 2001: Pittsburgh Filmmakers Media Arts Center. “Media /Tonic: a 30th Anniversary Celebration of Pittsburgh Filmmakers, Inc.; “ Pittsburgh, PA.
2001: SOMARTS Cultural Center. “Saint Rubidium’s Temple,” multi-media installation; San Francisco, California. 2002: Pittsburgh Dance Alloy. “New Directions: Dance + Video,” Dance Alloy’s Neighborhood Dance Center; Pittsburgh, Pennsylvania. 2002: MAK Center for Art and Culture. “Markings,” a program of experimental animation; Schindler House, West Hollywood, California. 2002: Jeonju International Film Festival. “American Experimental Animation,” curated by Seung-il Chon and Dong-Jin Seo, in conjunction with Canyon Cinema; South Korea. 2002: Hiroshima 2000. “Japan Seen Through the Eyes of Non-Japanese Artists,” International Animation Festival of Japan; Hiroshima, Japan. 2002: CINEMATH 2002. 20th Mathematical Sciences Research Institute (MSRI) Mathematics Film Festival; co-curated by Robert Osserman and Michael Singer; Berkeley Art Museum and Pacific Film Archive, University of California, Berkeley, California. 2002: Gwangju International Film Festival. “International Experimental Film and Video,” an invitational exhibition curated by Kim Ll-tae; Gwangju, South Korea. 2002- KINETICA 4: Abstraction, Animation, and Music. Presented by the Iota Center, Los Angeles; curated by William Moritz; 2002-03 International Tour: Pacific Film Archive, Berkeley; Anthology Film Archives, New York; Los Angeles County Museum of Art; Harvard Film Archive, Cambridge; Cinematheque Ontario, Toronto; Northwest Film Forum, Seattle; Videoex Festival, Zurich, Switzerland; 5th Brisbane International Film Festival, Brisbane Australia; International House, Philadelphia. 2004: ANIMADRID 2004. V Festival Internacional de Imagen Anima, Pozuelo de Alarcon, Madrid, Spain. 2004: Museum of Modern and Contemporary Art, Strasbourg. “Experimental Animated Cinema,” curated by Olivier Cotte; place Hans Jean Arp, Strasbourg, France. 2004: AUDIO VISUAL ENCOUNTERS. “Visions of Japan: Animation, Fiction, and Experimental,” the International Festival of New Media; curated by Julien Dusouchet, Lille, France. 2005: Anthology Film Archives. “Paul Sharits and Paul Glabicki,” a program of the “Crossroads” series, curated by Robert Haller; New York. 2005: DAUMENKINO (The Flip Book Show). A international exhibition of flip books created by170 artists and filmmakers (1900 – 2005), Kunsthalle Dusseldorf, Dusseldorf, Germany. 2006: Boston Cyberarts Festival: Visual Music Marathon. Curated by Bruce Wands, School of Visual Arts and New York Digital Salon, and Larry Cuba, IotaCenter; Northeastern University, Boston. 2011: Islip Art Museum. “Secret Message,” curated by Karen Shaw, work provided courtesy of Kim Foster Gallery; Islip, Long Island, New York. 2012: Clarion University Art Gallery. “What’s Up Pittsburgh?,” Gallery Director: Vicky A. Clark; Clarion, Pennsylvania. 2012: Kim Foster Gallery. 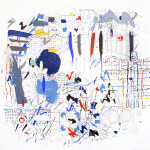 “Selections: Summer 2012,” a group exhibition of gallery artists; New York, New York. 2013: National Gallery of Art. “Cine-Concert: Abstract Animation Since 1970;” curated by Sharon Louden; Washington, DC. 2013: Kim Foster Gallery. 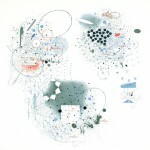 “Particle Physical,” a group show; curator: Antonio Petracca. 2013-14: ZKM/Museum of Contemporary Art. “SCHRIFTFILME: Script as Image in Movement;” curators: Dr. Bernd Scheffer, Dr. Christine Stenzer, Dr. Soenke Zehle, and Peter Weibel; a collaborate project and exhibition of ZKM/Center for Art and Media Karlsruhe, Germany, FACT Foundation for Art and Creative Technology Liverpool, UK, and Goethe Institutes worldwide. 2014: National Gallery of Art Vilnius. “TYPEMOTION: Type as Image in Motion;” Vilnius, Lithuania. 2014-15: FACT/Foundation for Art and Creative Technology. “TYPEMOTION;” Liverpool, UK. 2014: Kim Foster Gallery. “Sequential Abstraction;” New York, New York. 2014: Art Miami: CONTEXT. Participating Gallery: Kim Foster Gallery (New York), Miami, Florida. 2015: National Taiwan Museum of Fine Arts. “TYPEMOTION: Type as Image in Motion;” Gallery 103-107, Gallery Street, Taiwan. 2015: The Great Wall of Oakland. “WRIT LARGE: A Festival of Text;” curators: Timothy Furstnau, Liat Berdugo, and Rose Linke; artists included Paul Glabicki, Marcel Duchamp, Eduardo Kac, Claire Walka, John Fekner, W. Mark Sutherland, bpNichol, Oliver Harrison, Pavel Pavlov, and Augusto DeCampos; Broadway & W. Grand Avenue, Oakland, California, December 5, 2015. 2016: WRIT LARGE: Highlights of the 2015 Programs of the Great Wall of Oakland; curated by Timothy Furstnau; University California Santa Cruz. 1978: FRAMES: STATEMENTS AND DRAWINGS BY AMERICAN FILM ANIMATORS. “Diagram Film” images and text by Paul Glabicki; Published and Edited by George Griffin; 28 East 4th Street, New York, New York. 1981: ANIMATION FLIP BOOK COLLECTION. “Wipes” book and text; One of a collection of six flip books published by George Griffin, Metropolis Graphics; 28 East 4th Street; New York, New York. 1988: EXPERIMENTAL ANIMATION: ORIGINS OF A NEW ART. A Book by Robert Russett and Cecile Starr. Revised Edition; published by Da Capo Press, Inc., 233 Spring Street, New York, New York, 1988; Glabicki: pages 24,31. 1989: THE HISTORY OF ANIMATION. A Book by Charles Solomon. First Edition; published by Alfred A. Knopf, Inc., New York, New York,1989; Glabicki: Chapter: “The Captains and the Kings Depart, 1960-1989,” pp.259-300. 1992: CARTOONS: LE CINEMA D’ANIMATION 1892-1992. A Book by Giannalberto Bendazzi. French Edition; published by Editions Liana Levi, 31 rue de L’Abbe Gregorie 75006, Paris, 1992. Glabicki: “Visionnaries et Avant-gardistes aux Etats-Unis,” pages 332-340. 1994: THE HISTORY OF ANIMATION. A Book by Charles Solomon. Second, revised/updated edition; published by Wings Books, Random House Value Publishing, Avenel, New Jersey by arrangement with Knopf, Inc., 1994; Glabicki: Chapter: “The Captain and the Kings Depart, 1960-1994,” pp. 267-330. 1994: CARTOONS: ONE HUNDRED YEARS OF CINEMA ANIMATION. A Book by Giannalberto Bendazzi. New/revised English edition; published by Indiana University Press and John Libbey & Company London, UK, 1994; Glabicki: Chapter 17, ‘The United States of America; Visionaries and Avant-garde Artists,” pp. 231-260. 1998: ART IN MOTION: ANIMATION AESTHETICS. A Book by Maureen Furniss. Published by John Libbey & Company Pty Ltd, Sidney, Australia, 1998; Glabicki: Chapter 3: “Alternatives in Animation Production, pp. 29-60; and Chapter 5: “General Concepts: Sound and Structural Design,” pp. 85-108. 2002: IL ETAIT UNE FOIS LE DESSIN ANIME. A book by Olivier Cotte; published by Dreamland Press Editeur; French language edition, Paris, France, 2002; Glabicki: Chapter 3: “Le Cinema d’Animationaux Etats-Unis: Experimentation Independante et Individualites,” pp. 45-144. 2003: ANIMATION IN THE HOME DIGITAL STUDIO: CREATION TO DISTRIBUTION. A book by Steven Subotnick; published by Focal Press International; Glabicki: Chapter 2: “A Selection of Animators,” pp. 13-32. 2003: ANIMATION UNLIMITED: INNOVATIVE SHORT FILMS SINCE 1940. A book by Liz Faber and Helen Walters; with companion DVD, published by Laurence King publishing, London, United Kingdom; Glabicki: “Introduction,” pp. 6-9, and Chapter 1: “Form,” pp. 10-47. 2005: CROSSROADS: AVANT-GARDE FILM IN PITTSBURGH IN THE 1970s. A book by Robert Haller; published by the Anthology Film Archives, New York: Glabicki: Chapter 27, and pp. 52 – 80. 2009: HYPERANIMATION: DIGITAL IMAGES AND VIRTUAL WORLDS. A book by Robert Russett; published by John Libbey Publishing, UK, and Indiana University Press. 2010: CHELSEA CLINTON NEWS. ArtWeek: “Marking Time,” a review of the exhibition “Drawings Continued” at Kim Foster Gallery, written by Joe Bendik, New York, February 25, 2010. 2014: NEW YORK ART EXAMINER. “Relativity Drawings by Paul Glabicki at Kim Foster Gallery,” written by Daniel Gauss; published online at www.examiner.com, January 23, 2014. 2014: ARTCRITICAL. “Hyper-Saturation of Sign and Signifier: Paul Glabicki’s Relativity,” written by David Brody; published online at www.artcritical.com, January 30, 2014. 2014: FIBONACCISUSAN: Mathematical Art. “Chelsea Galleries – February; Paul Glabicki at Kim Foster Gallery,” written by Susan Happers; published online at http://fibonaccisusan.com, February 8, 2014. 2015: ARTE FUSE. “The Top Ten Art Gallery Shows of 2014,” written by Daniel Gauss; published online at http://artfuse.com/author/daniel-gauss, January 12, 2015.